It's been a BUSY week in our home. We've spent most of each day schooling. Anna is finishing her Challenge studies (one more week!) and we've been engaging in some fun review games with Grant. Each year I seem to have an internal battle with all of the wonderful things we COULD be doing and all of the things that are actually possible and necessary. Can you relate? I did one giant collage this week so that I can share resources and activities from our week. Just follow the numbers below and everything will work out! 1. Foundations Memory Work Review - fun times because Grant and I played this a lot and on Thursday he had a friend over for the day (also a CC child) who played with us. 2. We find LEGOS in the strangest places - even the kitchen sink! 3. Grant started Saxon 6/5 this week. We love Saxon. 4. I've been enjoying my husband's new work from home job. We have been walking in the morning and it's a great start to my day. 6. LOTS and LOTS of Latin this week with Anna - Henle Latin isn't for the faint of heart, and I'm so proud of the two of us for sticking with it! 7. My home has been filled with lots of Christmas piano music. I love that! 8. One of our Jesse Tree ornaments from DaySpring - this is such a great way for us to start our days during Advent. 9. Our small Jesse Tree - in our family room so we can always be reminded of the TRUE meaning of the season. Reading Unwrapping The Greatest Gift each day is a blessing. 10. Art supplies for our Mixed Media Art Workshop - Anna and I will be starting the first project this weekend! 11. Saxon Teacher DVDs solve any debates we have over how to solve math problems. Math is a dialectic discussion with my 8th grader, so there you go. 12. Anna is enthralled with Miss Peregrine's Home for Peculiar Children - this is a book for middle/high schoolers. Grant's birthday is December 12 - which also happens to be a very busy weekend for our family because it contains three children's chorus performances for Anna. 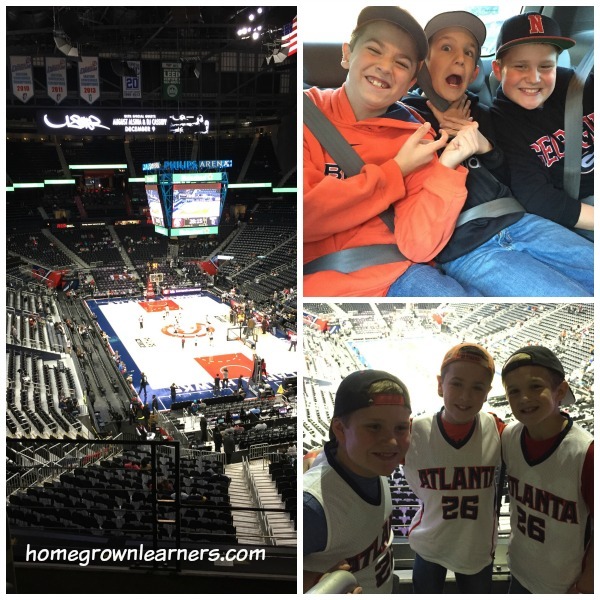 So - we decided to celebrate a bit early and take Grant and two friends to see the Atlanta Hawks play basketball. It's so nice for your children to have respectful, kind friends. We thoroughly enjoyed taking the boys to the game, and the spend the night afterwards was a lot of fun, too! As I write this, we are preparing to take a group of CC Challenge students to volunteer at the processing center this evening. I'll be posting about our trip next week I'm sure. Last year at this time I was preparing to travel to Ecuador to deliver boxes. Maybe one day I will be able to go again - it was a life changing experience. Tell me about your week! How is your December shaping up? Link up with Collage Friday and join this wonderful community of homeschooling moms that faithfully support each other week in and week out. What a blessing you all are to me - and to each other!